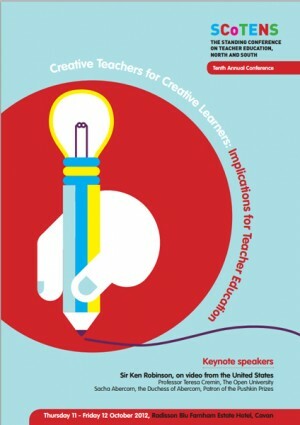 Creative Teachers for Creative Learners: Implications for Teacher Education. Our tenth annual conference, held in Cavan in October 2012, titled Creative Teachers for Creative Learners: Implications for Teacher Education brought together local and international expertise in classroom creativity. The conference was officially opened by Irish Minister of Education and Skills, Mr Ruairi Quinn TD, and the NI Minister for Education, Mr John O’Dowd MLA. Both Ministers emphasised the importance of digital technologies for teaching learning and assessment. In launching Approaches to Creativity: A Guide for Teachers, by Orison Carlile and Anne Jordan (McGraw-Hill/Open University Press), Minister Quinn emphasised his support for teachers in their role of unlocking young peoples’ creativity. Official Opening by Irish Minister of Education and Skills, Mr Ruairi Quinn TD, and the NI Minister for Education, Mr John O’Dowd MLA. Launch of book: Approaches to Creativity: A Guide for Teachers* by Mr Ruairi Quinn with a short afterword by co-author Professor Orison Carlile. Professor Teresa Cremin, Professor of Education (Literacy), The Open University: Inspiring passion, possibility and creativity in teaching and learning – followed by questions and discussion. Mr Richard Hanna, Interim Chief Executive, NI Council for the Curriculum, Examinations and Assessment (CCEA): Innovation and creative classrooms – how NCCA and CCEA work can support creative teaching and learning. This workshop will explore an approach to aesthetic education devised in the Lincoln Centre Institute in New York and premised on the work of Maxine Greene in which students develop their capacities for imaginative learning by engaging with a live work of art: a painting, play, musical recital, poem or film. This presentation/workshop will introduce an innovative, social constructivist approach – CRiSTaL (Critical Reflection in Science Teaching and Learning) – designed to support second year BSc Science Education students to observe, analyse and construct lessons before beginning their teaching practice in second level schools. This workshop will examine perspectives on creativity, imagination and innovation as communicated by primary teachers while participating in online continuing professional development, and comparing viewpoints expressed in online discourse with workshop discussions and other sources. This seminar will focus on the use of iPads within a Severe Learning Disability setting and in a mainstream primary school. The facilitators will be exploring the use of iPads for assessment and how they can be used to support pupils with ASD and in a mainstream classroom. Dr Tom Hesketh and Professor Teresa O’Doherty, SCoTENS Co-Chairs: The future of SCoTENS 10 years on: a session to discuss SCoTENS’ future plans, following a very positive external evaluation by a team from Oxford University’s Department of Education. Promoting Literacy and Numeracy through Teacher Education: SCoTENS 2011 Conference and Annual Reports, launched by Ms Brigid McManus, former Secretary General, Department of Education and Skills The compilation report: Exploring Japanese Lesson Study as a Model of Peer-to-Peer Professional Learning; Effective Mentoring in Physical Education Teacher Education, and Domestic Abuse: Using Arts-based Education to help Student Teachers learn about the Context and Impact on Children, launched by Professor Harry McMahon, formerly of University of Ulster, co-founder of SCoTENS. Optimising Creativity in Teachers and Students: the implications for Teacher Educators, followed by plenary discussion. Inspiring Educators: the work of the Pushkin Trust, with Anne McErlane, Regional Leader, the Pushkin Trust, and two participating head teachers, Siobhan Smith and Carmel McKeown. Creative Technology Innovation and Creative Pedagogy – the SMART bottom line. Sir Ken Robinson, closing address (on video from the US) – A call to action.